Thanks! 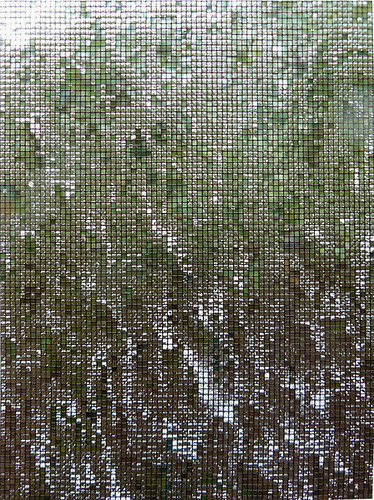 I've often wanted to get that shot when it rains hard at our house, but my old camera couldn't hold the proper focus. Yes, I think the Greeks went without screens! Even today, most European homes lack them. Fewer bugs of the annoying sort, I imagine. I like the Argos idea. I was thinking of one of those very early computer graphics experiments. Thanks. It rained a lot yesterday. In some places 1/4 of the average annual rainfall fell in less than two hours. Of course, the average annual rainfall is a little shy of twelve inches. Absolutely fabulous pattern. I thought it might be tiles but, looks really great. I can see the tiles. I wish I had tiles that cool! That image could be straightened out in Photoshop and, a color map made of it to then be recreated in tiles. I'm sure there has to be a way to do it based on your image. I think it would be awesome to see a whole wall covered like that, don't you? An intriguing idea. The screen itself is warped, so I'm not sure how to straighten it in photoshop. Of course, then I'd have the problem of figuring out how to make the tiles! Making the tiles: in Photoshop you can use the Pantone® colors to find out exactly the color you wanted to use, generally count up the number of tiles per color, have the colors coded on a printout, get started, pray for success. :-) Seriously, it seems something like that could be done. What about creating a grid in PS and then mimicking the patterning of the screen to get something close to the image without having to use so many tiles? Let me try here to straighten out the image and I'll send it back to you afterwards. Nice! I have the original image, if you're interested. It's big, but not too big. Do you have a Gmail account? I know your screen is delightfully soaked, but after my first glance at the photo I thought, "Eeeeeee! That looks just like my silly, eighties-inspired purse!" Glee. I remember that look. Sort of like the glittery double of acid wash! I'm really wallowing in the crass nature of all this eighties-inspired gear that's being produced right now. I'm not buying a whole lot of it, but I love to stare at when I'm at Target. I'm a crow ogling the bright, shiny object. Crows are smart birds, now more than never. That's what arsemuffin said--that I'm a "smart bird!" Funny thing is, I recently watched Sylvia with Gwyneth Paltrow and Daniel Craig. I didn't really like the movie that much, but it reminded me how much I like Ted Hughes: "He laughed himself to the centre of himself. / And attacked." So I put Birthday Letters on my nightstand and I'm re-reading it bit by bit. Ted got a bad rap, I think. It can't be easy living with Silvia Plath. I think I know what I'm talking about here! I'm still giggling to myself about your last response.